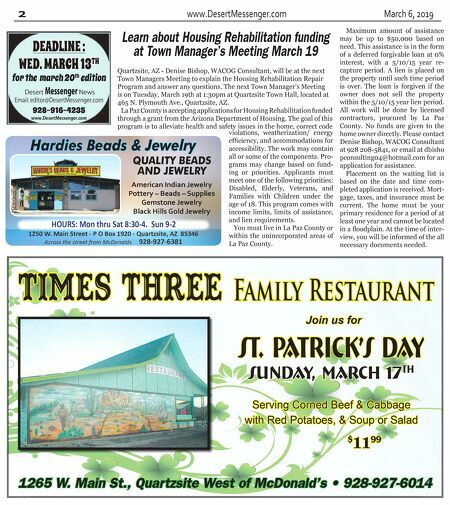 March 6, 2019 www.DesertMessenger.com 3 Leesa Bolden, LAc, MAOM Offering pain relief and accelerated healing since 1995 The Whole Body Repair Shop Acupuncture, Massage, Nutrition & Herbs Meditation & Qigong Instruction 512-784-6929 Masters of Oriental Medicine Licensed Acupuncturist Now In Quartzsite & Ehrenberg ~ By Appointment Only AUCTION! Saturday March 16th 2019 Preview at 7:30am AUCTION STARTS AT 9:00AM Quartzsite Consignment Shop 55 E. Kuehn St. #A 35 QUARTZSITE, AZ (Across from Bad Boys Cafe) Pickup Campers, Travel Trailers, RVs, Utility Trailers, Flatbed Trailers, Storage Trailers, Boat Trailers, RV Parts, Supplies & Acc, Tow Brackets & Tow Bars, Tow Brakes, Furnaces, Water Heaters, Receiver Hitches, 5th Wheel & Gooseneck Hitches, RV Refrigerators, Household Refrigerators Washer/Dryers, Freez- ers, Boating Stuff, Suzuki Parts, Tools, Electronics, Collectables, Antiques, Kitchen & Household, Electrical Stuff, Cars, Trucks, Vans, Motorcycles, ATVs, Scooters. Tires for: Trailers, Trucks, RVs, ATVs etc. (4" to 24.5") VENDOR SUPPLIES:Tents, Car- pets, Tables, Racks, Plus Products & Supplies to Vend. MAIN ST EXIT 17 EXIT 19 N KUEHN ST. X TOTAL LIQUIDATION! John Helsten Auctioneer Valley Auction Services, Pearce, AZ since 1976 520-686-0211 NO BUYERS PREMIUM! Some Reserve Items SOLD AS IS! DEALERS WELCOME! CASH OR CREDIT CARDS! DON'T MISS THIS! 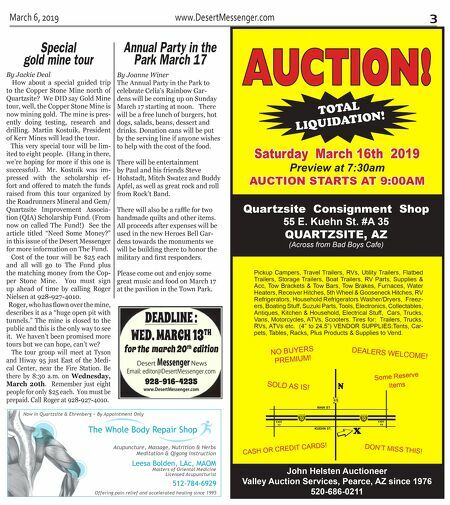 Annual Party in the Park March 17 By Jackie Deal How about a special guided trip to the Copper Stone Mine north of Quartzsite? We DID say Gold Mine tour, well, the Copper Stone Mine is now mining gold. The mine is pres- ently doing testing, research and drilling. Martin Kostuik, President of Kerr Mines will lead the tour. This very special tour will be lim- ited to eight people. (Hang in there, we're hoping for more if this one is successful). Mr. Kostuik was im- pressed with the scholarship ef- fort and offered to match the funds raised from this tour organized by the Roadrunners Mineral and Gem/ Quartzsite Improvement Associa- tion (QIA) Scholarship Fund. (From now on called The Fund!) See the article titled "Need Some Money?" in this issue of the Desert Messenger for more information on The Fund. Cost of the tour will be $25 each and all will go to The Fund plus the matching money from the Cop- per Stone Mine. You must sign up ahead of time by calling Roger Nielsen at 928-927-4010. Roger, who has fl own over the mine, describes it as a "huge open pit with tunnels." The mine is closed to the public and this is the only way to see it. We haven't been promised more tours but we can hope, can't we? The tour group will meet at Tyson and Hiway 95 just East of the Medi- cal Center, near the Fire Station. Be there by 8:30 a.m. on Wednesday, March 20th. Remember just eight people for only $25 each. You must be prepaid. Call Roger at 928-927-4010. Special gold mine tour DEADLINE : WED. MARCH 13 TH for the march 20 th edition Desert Messenger News Email: editor@DesertMessenger.com 928-916-4235 www.DesertMessenger.com By Joanne Winer The Annual Party in the Park to celebrate Celia's Rainbow Gar- dens will be coming up on Sunday March 17 starting at noon. There will be a free lunch of burgers, hot dogs, salads, beans, dessert and drinks. Donation cans will be put by the serving line if anyone wishes to help with the cost of the food. There will be entertainment by Paul and his friends Steve Hohstadt, Mitch Swatez and Buddy Apfel, as well as great rock and roll from Rock't Band. There will also be a raffl e for two handmade quilts and other items. All proceeds after expenses will be used in the new Heroes Bell Gar- dens towards the monuments we will be building there to honor the military and fi rst responders. Please come out and enjoy some great music and food on March 17 at the pavilion in the Town Park.